The state plans to build the new structure next to the existing bridge, demolish the old one, then slide the new bridge into place. The state is moving forward with a plan to replace a busy I-295 bridge in Portland using an accelerated construction method that could mean closing the highway for just a single weekend in 2021. The plan calls for building a replacement bridge next to the current one, then demolishing the old structure and immediately sliding the new one into place. Engineers from the Maine Department of Transportation will discuss how they plan to replace the Veranda Street Bridge during a public meeting at Merrill Auditorium Rehearsal Hall in Portland Thursday at 6 p.m. 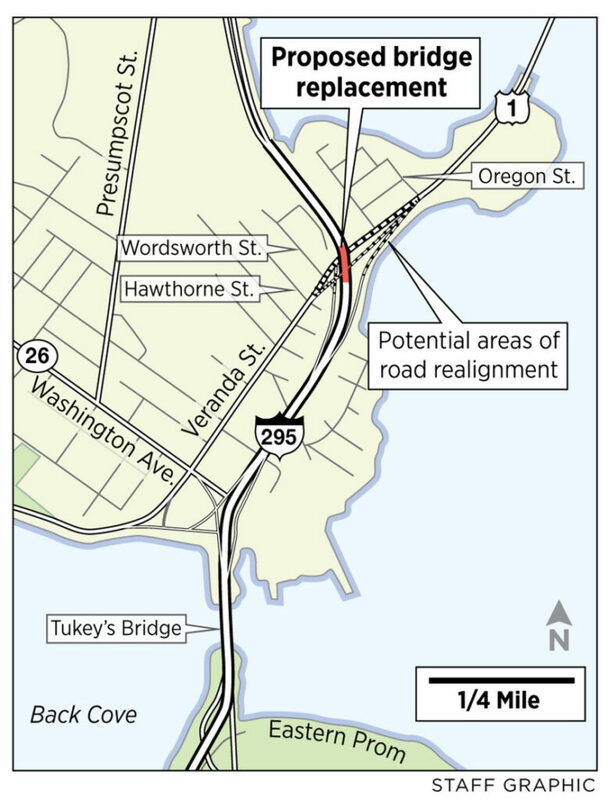 The I-295 bridge, a few hundred feet north of Tukey’s Bridge, carries more than 53,000 vehicles a day over Veranda Street, a two-lane street that connects Portland’s Back Cove and Washington Avenue with Route 1 in Falmouth. Construction should begin in April 2020 and calls for closing the heavily traveled highway – and diverting traffic onto the Maine Turnpike – for one weekend in April 2021. Veranda Street will also be closed for five days in April 2021. 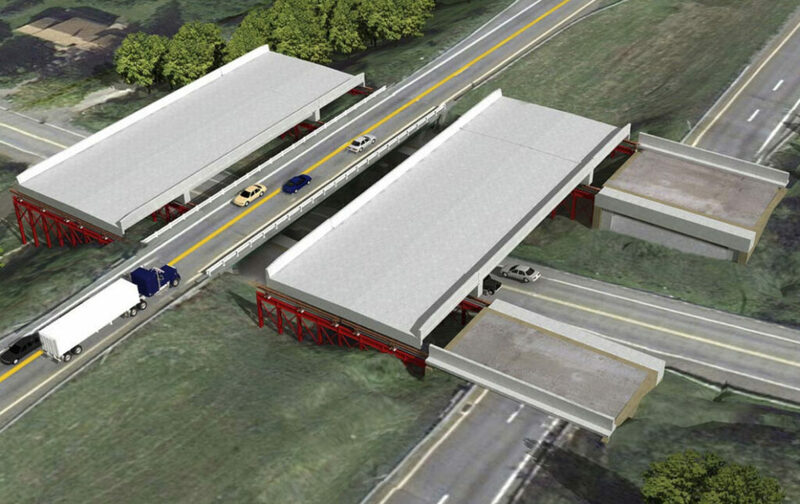 While divided highways normally require building two replacement bridges, the new Veranda Street bridge will be built in one piece, with a single platform for the north and south bound lanes. Nina Fisher, the deputy transportation commissioner, said the bridge replacement technique has been used at least twice in Maine, including Littlefields Bridge in Auburn over the Little Androscoggin River. Accelerated bridge construction is not uncommon, but is used more extensively in other parts of the country, Fisher said. According to the Federal Highway Administration, accelerated bridge or slide-in bridge construction is a relatively new process that allows states to reduce the amount of on-site construction time needed to build or replace bridges. The FHA says the technique can significantly reduce traffic impacts, especially in urban centers with high traffic volume. The project manager, Joel Kittredge, said the $12.5 million project should be finished by November 2021. Kittredge concedes that a project on a highway as heavily traveled as I-295 will have an impact on motorists. That particular stretch is prone to traffic congestion in both directions, especially during commutes or when there has been a traffic accident. “Specific traffic control plans, traffic control signage, advanced public notification, and outreach through television, radio, and social media, are all available tools to be used to mitigate traffic effects to the maximum amount possible,” Kittredge said. The accelerated construction process involves building the foundations of the new bridge beneath the existing bridge and building the deck of the new bridge adjacent to the existing bridge. The preparation can be done without affecting traffic flow on Veranda Street and I-295, according to Kittredge. Once the advance construction work has been completed, the old bridge will be demolished and the top section of the new one will slide laterally onto the foundations, after which I-295 can reopen to traffic. Kittredge said the accelerated technique reduces the construction period from four years to two and will significantly reduce the impact on motorists. Traffic detours will be necessary during the construction period. “These detours will be clearly signed and traffic signals at select intersections will be retimed for optimization of traffic flow. One of the detours does include rerouting traffic to Route 1 in Falmouth,” Kittredge said.